The right figure is the artist. Well, at least it looks like him, and everyone takes it to be a self-portrait, but he says it isn’t or at least we’re not supposed to be sure. But I say to him, look, that guy sees into the future, the back of his head tells me that, and the future for a figure in a painting can only be the finished painting, and only the artist can visualize that. I’m not really sure, though, what makes me know that he’s looking into the future, that he’s seeing shapes taking form within the fogbank looming before him. 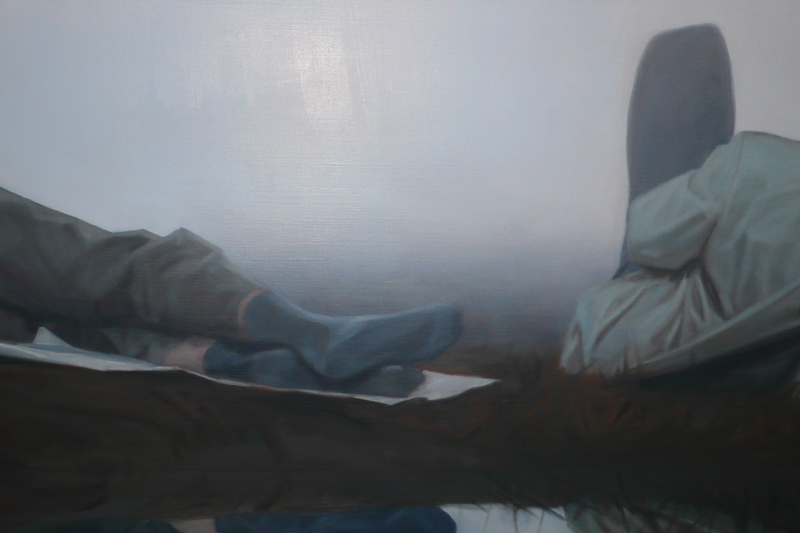 Is it just that overly ambitious posture in which he lies there consuming, devouring nature? If he’s not careful he’ll pop a vertebra—this guy relaxes like Tom Cruise on the run. Of course, he has reason to be a little nervous, since as the artist he’s the only one in the picture who consciously feels the viewer’s gaze piercing his back. He feels we’re judging his performance, on more than one level. In the middle, that is the art. Not a symbolic personification of all art, but a stand-in for the works that the artist painted before, pictures of individuals that could not function as they seemed lost to their surroundings which receded to make room for an isolating gray. Sometimes homeless people, like this figure now lying shoeless on a thin blanket. His head is still wrapped in foggy reminiscence of the past, but it seems like a withdrawal into self-awareness is imminent. An action, a small defensive movement, will suffice for a complete change of position. On the left, that’s me. 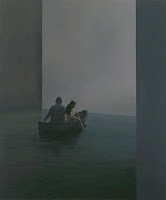 (I’m half-pissed that I don’t have a cameo here, after all the artist, Tim Eitel, is my brother, so he should one day put me out of my mortality.) No, I’m only in the picture as the viewer. My gaze holds the tableau in balance, my knowing acceptance of things as they are. I do not meddle with the art. I seem to have a defeatist sense of humor. I tell the viewer without the picture how to read the scene, my attitude reveals that the misty mass is not The Fog of movie stardom, a natural habitat for things that will kill us. It is more like the inner void as an alive canvas for projections. If the above reads a little too willful, of course it is. What desire I feel to project any kind of concrete meaning into the figures stems from their subtle incongruousness: they are almost like collaged together. The scene isn’t a group, all three postures seem so individual. Where are they from? The right figure, as it lies by the water, makes me think of a fountain by Ammannati, and I wouldn’t be surprised if the middle were a variation on a posture from that supreme quarry of existential poses, The Raft of the Medusa. But somehow the possibility of art-historical references doesn’t interest me here. Reflection the painting is called. But none of the protagonists is aware of the reflected image of self. Which does bring us to another artwork, Caravaggio’s Narcissus, of all the pond paintings I can think of the most relevant here. 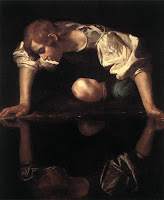 The Caravaggio painting is supposed to be about a youth who cannot avert his gaze from a reflection of his own beauty (and he will die for that and, if we follow Ovid’s silly conceit, sort of turn into a flower). It doesn’t at all look like it, though. We do not see the youth lost in himself, but rather locking gaze with his other half, which is reflected in the pond. 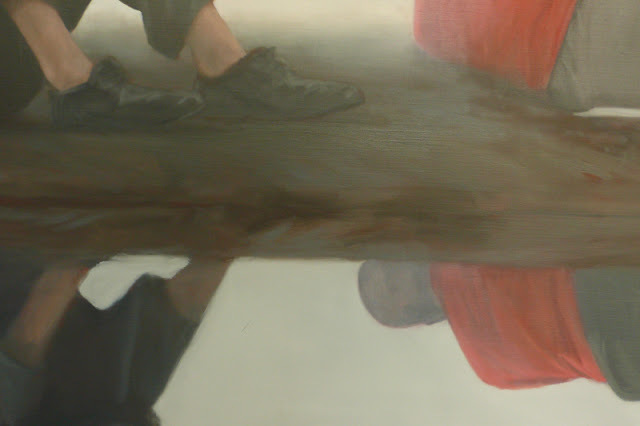 Since they both part off the space between them in almost a perfect circle, with the knee at the heart (in Caravaggio I’m sure with strong sexual connotations) it seems more like pondering the pond itself, from both sides. Reflecting upon nature to come closer to our own nature, a study of life force and the way we contain the whole world within ourselves because we cannot see from outside and must remain self-centered. And this, more complex but less to the point, is about where Tim’s painting takes off, too. Three attitudes towards that, maybe. 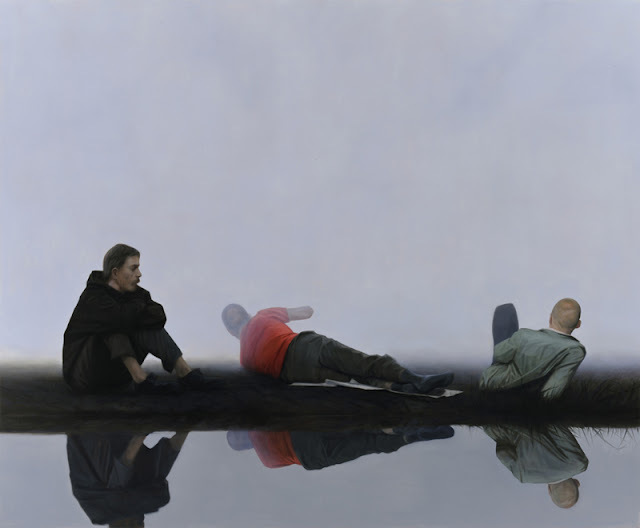 Tim’s effort is not allegory, that was what immediately struck me when I first saw the painting hanging in the gallery: it was not, like many of Tim’s earlier efforts, a painting that tried to be about people. Take his Boat from 2004, it is splendid allegory on the human condition, but the artist’s viewpoint is from above, indicating the demiurgic will to make that scene happen before our eyes. In Reflection (from 2010, by the way), we’re really all in the same boat, or rather on the same narrow strip of wasteland. Protagonist, artist and beholder alike. And, I don’t know, that made me feel upbeat when I saw it. It’s such an optimistic painting, did you notice?